Its sweet eucalyptus scent purifies the air of your home and creates a fresh ambience. It also stimulates the nervous system and provides the calm we need in case of stress. In cosmetic care, it helps treat skin infections and heal wounds. 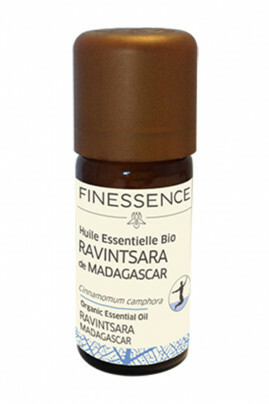 No more evils of winter thanks to Finessence Organic Ravintsara Essential Oil from Madagascar ! Cinnamomum camphora (camphor) leaf oil, linalool*, limonene*, geraniol*. May be fatal if swallowed and enters airways. Causes skin irritation. May cause an allergic skin reaction. Cause serious eye irritation. Toxic to aquatic life with long-lasting effect.